Whether you only need a chair for one or you just don’t like sharing, a hanging swing chair for outdoor use is perfect for you! 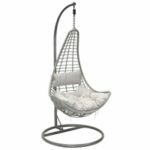 However, if you have to consider other guests, then perhaps buying the best 3 seater garden swing chair might be a better option or addition to your hanging swing chair. 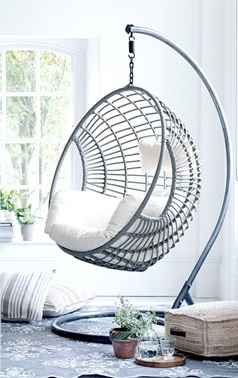 Having said that, some free standing swing chairs can be used indoors as well as outdoors. Therefore, you can get more use out of it and you don’t have to find storage space for it in the shed or garage when it’s not in use. In addition, it also takes up less space than a 3 seater swing chair or a free standing hammock. 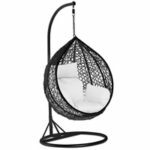 Nonetheless, the latter is still a different product to a garden swing chair, so if you admire the design and style of a hanging garden swing chair then go for it! 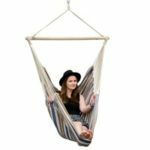 There’s not really too much to take into consideration when choosing a hanging swing chair, other than your preferred style. However, there may be very few factors that may sway your decision, which we’ll list below. Material – When it comes to choosing the material, usually the cushion will be made from polyester. 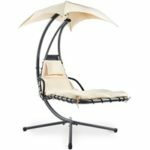 However, for models that come with a frame, you can choose either slightly cheaper materials such as powder coated steel, or higher quality materials such as iron and rattan. Maximum user weight – Sometimes two people might like to sit on the swing chair at the same time, but just be careful this doesn’t exceed the maximum weight limit. Usually this limit will be enough to support most individual’s weight. Frame/stand included – Models that come with a frame or stand will cost you a lot more money. But, it can be deployed pretty much anywhere, as it’s completely free standing. Whereas, for models without a stand, you can buy a garden swing chair stand separately, or hang it somewhere secure with a rope. Assembly required – Garden swing chairs with a stand will require some assembly. However, this is usually quite straightforward and shouldn’t be difficult for most people. 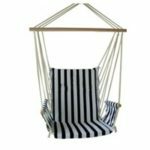 Weight – If you need to often move your hanging swing chair and stand then you may prefer a lighter frame. However, lighter frames are usually made with cheaper materials. No matter how high or how low, it feels good being dangling in mid-air! But, what option is the best for you? Since the two above have many similarities, many people are usually in two minds as to what one to go for. Therefore, we’ve compared the two below. Takes up less space when deployed. More expensive to buy with the frame. Can’t take the frame with you away on trips. The frame on many models can easily be detached, making it easy to transport. Takes up less space in storage. More styles and options to choose from. Takes up more space when deployed.